Former Sunrise member, Pastor Stephen Gatson, who is now the Pastor of Greater New Life Baptist Church, invite you and your youth ministry to attend their Annual Youth Explosion/Revival on Saturday, November 16 – Monday, November 18, 2013 at 6:00pm each night. If you have a youth(s) that would like to ministry in song, dance, mime, etc., fill out the information below and return it as soon as possible. Forms can be submitted to Lisa Gaston at arlethagaston@yahoo.com. 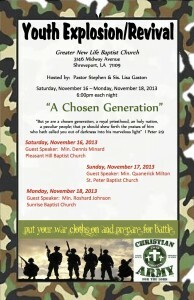 For additional information contact Lisa Gaston at (318) 773-7504.